Now that we are in the grip of winter, I think longingly of the delicious cheese dishes which are so typical of the ski resorts in Savoie, in the French Alps. The melting cheese in fondues, Raclette melted in front of log fires and the flavoursome potato bake Tartiflette, are some of the most famous. I have a good stock of Reblochon de Savoie, the essential ingredient for a Tartiflette, so I decided to make one this week. 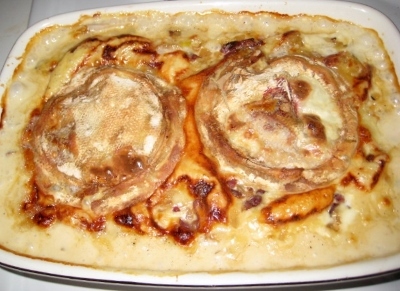 This traditional dish is a creamy potato bake made with lardons (strong flavoured chunks of bacon) onions, cream and wine, then a whole Reblochon is sliced in half and placed on top of the potato bake. I used the light cream (Crème legere) from Normandie instead of the full fat cream as the dish is rich. You cook it in the oven until the cheese has melted completely over the potatoes and has turned a dark golden colour. I paired this full flavoured, creamy dish with a Hugel Riesling from Alsace as this wine has plenty of flavour to balance the strong cheesy taste of this dish. Bonjour! I have just returned from a week in Paris and loved every minute. 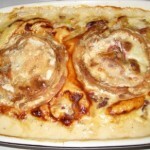 I want try to make tartiflette which I thought was delicious. Every street side café sells it. What is a good substitute for reblochon cheese? Any rind cheese?